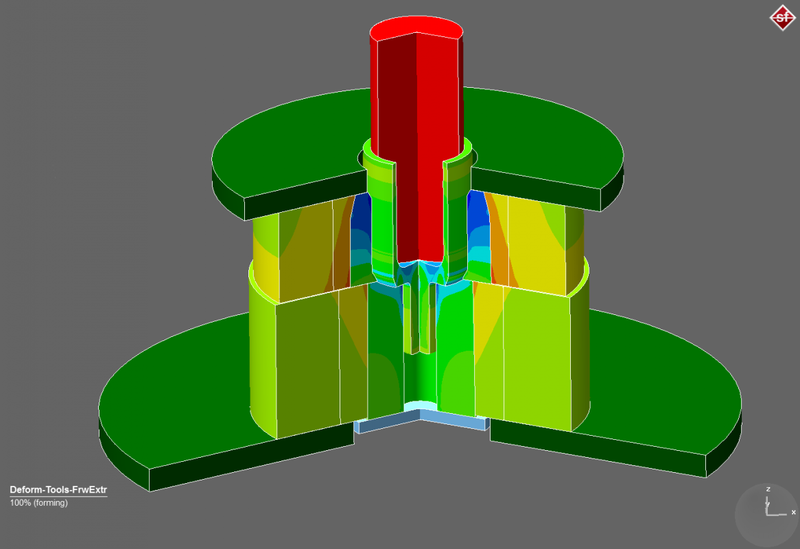 Simufact Forming Die Analysis allows for a detailed view into the stresses in the dies. Simufact Forming Microstructure Matilda is a special module for the microstructure computations of steel and nickel-based alloys, based on “MatILDa”. This group covers additional technologies that increase the performance of your simulation solution. The Simufact Forming Parallel Core module allows parallel computations that increase the simulation speed, while the Simufact Forming Additional Job module enables you to run simulations simultaneously. With the Additional GUI modules, we offer you more Simufact Forming GUIs for pre- and post-processing. 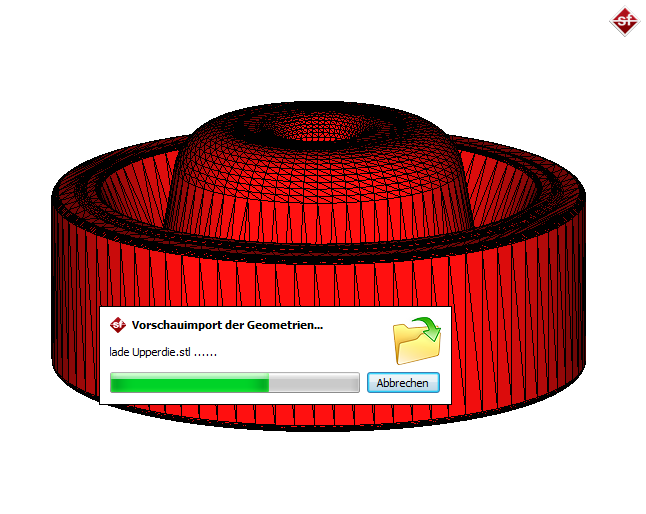 Our CAD interface helps you to import geometries easily from native CAD files. It provides interfaces for major CAD systems and file formats such as STEP, VDA, DXF, ACIS, Parasolid, CATIA V4, CATIA V5, PTC Creo, NX, SolidWorks and Inventor. 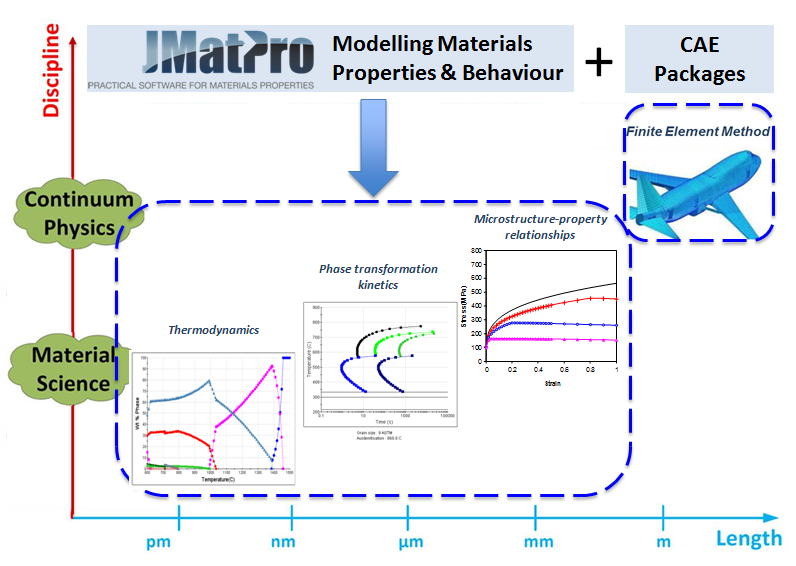 Material Data offers more material data sets, in addition to the material data included in the Simufact Forming Hub; among them we offer JMatPro data sets. This module enables you to simulate die strains and stresses in order to predict the stress distribution in the forming dies. This allows for a much more detailed view of the die’s behavior than is possible when only using Simufact Forming Hub. For every die, whatever the level of complexity, whether they are pre-stressed dies or die reinforcements with an unlimited number of components, this module can offer a greater insight into the die's behavior. Knowledge of stress distribution, especially the location and amplitude of tension maxima within the dies, is necessary to plan effective counter-measures at the time of design in order to extend the die life, analyze die failures and to evaluate alternative concepts. Reinforcements (for example, through shrinkage assembly, even multi-tiered ones) can of course be simulated and optimized in regard to their position and overlap. This application module offers the parallelization of simulations by using the effective Domain Decomposition Method (DDM) for the FE-Solver, and Shared Memory Parallelization (SMP) for the FE-Solver and the FV-Solver. Due to these methods computation time is dramatically reduced. Through parallelization by DDM, the simulated model is disassembled automatically into different domains that are linked by additional numerical boundary conditions. For every domain a distinct stiffness matrix, which contains all elements, nodes and boundary conditions is generated. The displacements and forces are then calculated for every time step when solving the stiffness matrix. When compared to non-parallelized simulations, this method allows for several smaller stiffness matrices to replace one big stiffness matrix. The computational effort required, due to the increasing size of the stiffness matrix, increases more than linearly in a FEM simulation. DDM generates smaller stiffness matrices, which therefore allow for the computational effort of each domain to be reduced disproportionately, ultimately resulting in an increase in computational speed. Additional speed-up is also gained by using different cores or processors within the work station or a cluster to solve the stiffness matrices of the single domains simultaneously and independently from each other. Remeshing operations are achieved by joining the domains, remeshing the mesh and then re-disassembling the model into new separate domains. DDM parallelization can be combined with shared memory parallelization. The domain computation is then further distributed to additional cores / processors for selected computing operations related to the stiffness matrix assembly and the equation solving. Shared memory parallelization can be used without DDM parallelization, too. The number of domains that can be utilized for parallelization depends on the number of licensed Simufact.forming Parallel Core modules. For example, if a simulation should be parallelized on twelve cores, then eleven Simufact.forming Parallel Cores must be acquired in addition to Simufact.forming Hub. DDM cannot be used for FV simulations since the computational effort of FV simulations increases linearly with the number of nodes / elements. Shared memory parallelization is the most effective method for FV simulations. With Simufact Forming Hub, one simulation can run at a time, as well as previous simulations can be evaluated and new simulations can be prepared simultaneously. Every Simufact Forming Additional Job increases the number of simultaneous simulations. This application module increases productivity by letting you run two or more simulations at the same time. If more than one simulation uses features from an application module, the respective module must also be licensed accordingly. Using Simufact Forming Additional Job does not decrease the computation time of a single simulation. The module can be combined with Simufact Forming Parallel Core. Licensed Simufact Forming Parallel Cores can be distributed in any order to the number of licensed jobs. Every Additional GUI increases the number of Simufact.forming graphical user interfaces (GUIs) that can be opened simultaneously for pre- or post-processing. Within Simufact Forming Hub, 2 GUIs are licensed. The import interfaces for STEP, STL and IGES formats are already contained in the Simufact Forming Hub, as well as an import interface for DXF for the import of roller geometries. Our import interface uses the CADfix® technology, from our software partner ITI TranscenDATA, which uses efficient repair functions to automatically correct for example surface descriptions that are not precisely closed. This means manual, time-consuming corrections are no longer necessary. If whole assemblies are saved in a file, they can be imported in one-step while maintaining the positions of the individual geometries. The degree of resolution (discretization) of the imported geometries is determined automatically, but can be adjusted by the user. Furthermore, you can remove geometric features that are irrelevant to the simulation (e.g., holes for transport devices) during import to reduce the model's size. The material data is calculated with the program JMatPro® from our software partner Sente Software, based on the individual compositions of the alloy and their (thermic) pre-treated state for a temperature range from room temperature to 1400°C, or to the melting point and for up to an effective plastic strain of four. For so-called general steels, you can calculate all the thermal, mechanical and plasto-mechanical properties required for a forming simulation, as well as the phase transformation diagrams needed for heat treatment simulations. All the material properties required for a forming simulation can be calculated, for stainless steels, cobalt alloys, nickel-based alloys, Ni-Fe superalloys and titanium alloys. Material data sets can be purchased individually, or as packages of five or ten data sets, and can be imported into the Simufact.materials material database. If you require more detailed information about the material data available for use in Simufact.forming, or if you would like tips on how to acquire material data, then please contact us. In cooperation with the Institute for Material Science and Material Technology at the Vienna University of Technology, we can arrange more material data (e.g. for aluminum and titanium) for you.